"Sea of Cortez" redirects here. For the John Steinbeck book, see The Log from the Sea of Cortez. The Gulf is thought to be one of the most diverse seas on the planet, and is home to more than 5,000 species of micro-invertebrates. Home to over a million people, Baja California is the second-longest peninsula in the world, after the Malay Peninsula in Southeast Asia. Parts of the Gulf of California are a UNESCO World Heritage Site. The International Hydrographic Organization defines the southern limit of the Gulf of California as: "A line joining Piastla Point (23°38'N) in Mexico, and the southern extreme of Lower California". The Gulf of California is 1,126 km (700 mi) long and 48–241 km (30–150 mi) wide, with an area of 177,000 km2 (68,000 sq mi), a mean depth of 818.08 m (2,684.0 ft), and a volume of 145,000 km3 (35,000 cu mi). Geologic evidence is widely interpreted by geologists as indicating the Gulf of California came into being around 5.3 million years ago as tectonic forces rifted the Baja California Peninsula off the North American Plate. As part of this process, the East Pacific Rise propagated up the middle of the Gulf along the seabed. This extension of the East Pacific Rise is often referred to as the Gulf of California Rift Zone. The Gulf would extend as far as Indio, California, except for the tremendous delta created by the Colorado River. This delta blocks the sea from flooding the Mexicali and Imperial Valleys. Volcanism dominates the East Pacific Rise. The island of Isla Tortuga is one example of this ongoing volcanic activity. Furthermore, hydrothermal vents due to extension tectonic regime, related to the opening of the Gulf of California, are found in the Bahía de Concepción, Baja California Sur. The Gulf of California contains 37 major islands – the two largest being Isla Ángel de la Guarda and Tiburón Island. Most of the islands are found on the peninsular side of the gulf. In fact, many of the islands of the Sea of Cortez are the result of volcanic explosions that occurred during the early history of Baja California. The islands of Islas Marías, Islas San Francisco, and Isla Partida are thought to be the result of such explosions. The formations of the islands, however, are not dependent on each other. They were each formed as a result of an individual structural occurrence. Several islands, including Isla Coronados, are home to volcanoes. The gulf has more than 900 islets and islands which together total about 420 hectares. All of them as a whole were enacted as "Area Reserve and Migratory Bird Refuge and Wildlife" on August 2, 1978. In June 2000, the islands were given a new category "Protection Area Wildlife". In addition to this effort by the Mexican government, for its importance and recognition worldwide, all islands in the Gulf of California are also part of the international program "Man and Biosphere" (MAB) and are part of the World Reserve Network UNESCO Biosphere as Special Biosphere Reserve. Due to the vast expanse covered by this federal protected area conservation and management is carried out through a system of four regional directorates (one per bordering the Gulf of California state) by way of co-direction. There is a regional directorate in the states of Baja California, Baja California Sur, Sonora and Sinaloa. Notwithstanding the foregoing, the work of direct and indirect conservation is done in the islands is governed by a single Management Program, published in 2000, which is complemented by local and specific management programs (at individuals) archipelagos. The Directorate of Protection Area Wildlife California Gulf Islands (APFF-GCR) in Baja California is responsible for 56 islands located off the coast of the state. These are grouped into four archipelagos: San Luis Gonzaga or Enchanted, Guardian Angel, Bahia de los Angeles and San Lorenzo. The three general types of shores found in the Gulf of California include rocky shore, sandy beach, and tidal flat. Some of the rich biodiversity and high endemism that characterize the Gulf of California and make it such a hotspot for fishing can be attributed to seemingly insignificant factors, such as the types of rocks that make up a shore. Beaches with softer, more porous rocks (such as Coquina limestone, rhyolites, granite, or diorite) generally have a higher species richness than those with harder, smoother rocks (such as basalt or diabase). Porous rocks will naturally have more cracks and crevices in them, making them ideal living spaces for many animals. The rocks themselves, however, generally need to be stable on the shore for a habitat to be stable. Additionally, the color of the rocks can affect the organisms living on a shore. For example, darker rocks will be significantly warmer than lighter ones, and can deter animals that do not have a high tolerance for heat. The northern Gulf of California experiences tidal ranges of up to 5 m (16 ft). Mixed semidiurnal tides are the norm throughout most of the Gulf. In the Gulf of California, there are a number of negative estuaries, that is, ones in which the evaporation of seawater is relatively greater than that of the fresh water input. The salinities of these inlets are higher than that of the ocean. The temperatures, poikilothermal, of these negative estuaries also are higher than the general temperature of the Gulf. It is possible that at one time these estuaries were positive, that is, ones in which the seawater component is diluted; therefore, the water is brackish, with salinity less than that of the ocean. However, due to human modification of the land use around the Gulf of California and water diversion for municipal and agricultural use, there are no longer many rivers that freely empty into the Gulf of California. The upper Colorado River Delta is one example of a historically major estuary and wetlands ecosystem, that since the 20th century construction of upriver dams and diversion aqueducts on the Colorado River, is now a small ephemeral remnant estuary. The remaining Gulf inlets still are important to several species of fishes, crustaceans, and shellfish that are commercially harvested. Even though the shores of the Gulf of California are generally sheltered from the continuous wave shock that is experienced by most other North American shores, storms known as a "chubasco" can cause significant damage to shorelines, despite their brevity. The depth of the water helps to determine its temperature. For example, shallow depths are directly influenced by the local temperature of the air, while deeper waters are less susceptible to changes in air temperature. The temperature of the water in the Gulf of California generally experiences lows of 16 °C (61 °F) in winter and highs of 24 °C (75 °F) in summer. But temperatures can vary greatly in the gulf, and the water is almost always warmer by the coast than the open ocean. For example, the waters surrounding La Paz reach 30 °C (86 °F) in August, while the waters in neighboring city Cabo San Lucas, only reach 26 °C (79 °F). Occasionally, the northern Gulf of California will go through significantly cold winters. The water in the Northern Gulf can sometimes drop below 8 °C (46 °F), which can lead to a large die-off of marine organisms. The animals most susceptible to the large decrease in water temperature include macroscopic algae and plankton. The narrow sea is home to a rich ecosystem. 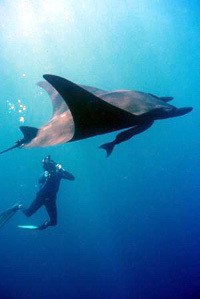 In addition to a wide range of endemic creatures, such as the critically endangered vaquita, it hosts many migratory species, such as the humpback whale, California gray whale, killer whale, manta ray, Humboldt squid and leatherback sea turtle, and the world's largest animal, the blue whale. The unusual resident populations of fin whales and sperm whales do not migrate annually. The area near the delta of the Colorado river has a small remnant population of the totoaba fish. This region has historically been a magnet for world-class sport fishing activities, with a rich history of sporting world records. The region also has a rich history as a commercial fishery. However, the data vary wildly according to the species being studied, and the Gulf's ability to recuperate after years of overfishing remains uncertain. Moreover, changes in terrestrial ecology, such as the vast reduction in flow from the Colorado River into the Gulf, have negatively affected fisheries, particularly in the northern region. The Gulf of California sustains a large number of marine mammals, many of which are rare and endangered. Its more than 900 islands are important nesting sites for thousands of seabirds, and its waters are primary breeding, feeding, and nursing grounds for myriad migratory and resident fish species. For decades, the gulf has been a primary source of two of Mexico's leading marine resources, sardines and anchovies. Water pollution is a problem in the Gulf of California, but the more immediate concerns are overfishing and bottom trawling, which destroys eelgrass beds and shellfish. Efforts by the Mexican government to create conservation zones and nature reserves have been hampered by lack of enforcement resources, as well as a lack of a political consensus on this issue of conservation of the Gulf. This occurs even though significant areas are a UNESCO World Heritage Site. The thousands of miles of coastline are remote and difficult to police, and the politically powerful commercial fishing industry has been slow to embrace even economically viable conservation measures, much less strict measures of conservation. Conservation of the Gulf's fisheries and coastlines is also complicated by a long history of overcapitalization in the sector, and the direct, often negative, impacts that conservation measures have on the livelihoods of Mexico's coastal inhabitants. At present, the Mexican government and business interests have promoted a macro-level, tourist development vision for the Gulf, the impacts of which on local ecology and society are uncertain. Coastal communities are highly reliant on both commercial and sport fishing, including San Felipe, San Carlos, Sonora, Cabo San Lucas, La Paz, Loreto, Guaymas, Bahía Kino, Puerto Peñasco, Topolobampo and Mulegé. The well-developed shrimp and sardine fleets of Mazatlán, on the Mexican mainland's Pacific coast, heavily exploit the commercial fisheries of the southern Gulf. Many marine organisms can only survive within a particular salinity range, which makes salinity a notable factor in determining the types of potentially commercial organisms found in the Gulf of California. The mean annual ranges of salinity of the Sea of Cortez are between 3.5 and 3.58% at the surface. Furthermore, the salinity of the water of the Northern Gulf of California is generally higher than the Central and Southern faunal regions due to the increased amount of evaporation that occurs in that region. Brusca, Richard C. (Editor) (2010). The Gulf of California: Biodiversity and Conservation. University of Arizona Press. pp. 354 pages. CS1 maint: Extra text: authors list (link) Studies by researchers, on both sides of the border, on the threats to the diversity of species in the gulf's waters. ^ a b c d Rebekah K. Nix. "The Gulf of California: A Physical, Geological, and Biological Study" (PDF). University of Texas at Dallas. Retrieved April 10, 2010. ^ a b c d e f g h i Richard C. Brusca (1973). A Handbook to the Common Intertidal Invertebrates of the Gulf of California. Tucson, Arizona: University of Arizona Press. pp. 10–15. ISBN 978-0-8165-0356-8. ^ Ernesto Campos, Alma Rosa de Campos & Jesús Angel de León-González (2009). "Diversity and ecological remarks of ectocommensals and ectoparasites (Annelida, Crustacea, Mollusca) of echinoids (Echinoidea: Mellitidae) in the Sea of Cortez, Mexico". Parasitology Research. 105 (2): 479–487. doi:10.1007/s00436-009-1419-8. PMID 19337754. ^ "Limits of Oceans and Seas, 3rd edition" (PDF). International Hydrographic Organization. 1953. p. 35. ^ Hamilton, W.B., 1961, Origin of the Gulf of California: GSA Bull., 72, 1307–1318. ^ "Science Plans RCL". review.nsf-margins.org. Retrieved May 27, 2008. ^ "Valle de los Cirios. Tesoro de Baja California". 14 July 2010. ^ "Área de Protección de Flora y Fauna Islas del Golfo de California en Baja California". ^ "Marine Biology of Baja California". Math.ucr.edu. Retrieved 2013-12-08. ^ "San Jorge Water Temperature (Sea) and Wetsuit Guide (Baja Sur, Mexico)". Surf-forecast.com. Retrieved 2013-12-08. Wikimedia Commons has media related to Gulf of California.